Monday August 22nd 1881. We got an early start and drove home by five oclock. We had ever so much fun on the way. John and Hatt were here and both feeling badly. Weather warmer today. Tuesday August 28th 1881 I went to town early this morning and had some work done on my teeth I tried to sew in the afternoon but did not accomplish much for the machine would not work. I wrote a letter to Charlie Russell in the evening. 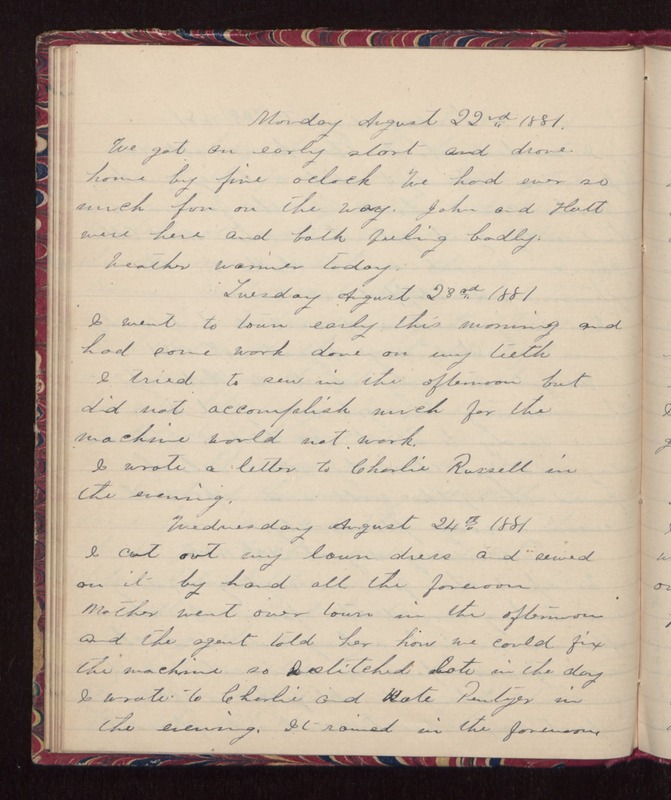 Wednesday August 24th 1881 I cut out my lawn dress and sewed on it by hand all the forenoon. Mother went over town in the afternoon and the agent told her how we could fix the machine so I stitched late in the day. I wrote to Charlie and Kate Pentzer in the evening. It rained in the forenoon.